Two mothers of seventh graders who attend Chatham Middle School in New Jersey have hired the Thomas More Law Center, a public interest law firm, after their legitimate objections to pro-Islamic curriculum in their children’s classes have resulted in personal and social media attacks upon them within their community. “Their crime: appearing on Fox TV’s Tucker Carlson Show to voice concerns about Islamic indoctrination of Chatham Middle School seventh graders,” the Thomas More Law Center said in a press release on Thursday. Libby Hilsenrath and Nancy Gayer, with sons in different classes in the seventh grade, [first] detailed their concerns in person to the Chatham Board of Education at their February 6, 2017 public meeting. Superintendent Michael LaSusa indicated that any change to the curriculum was unlikely, and the next day also refused their request to meet privately with him to discuss their concerns. “The promotion of Islam is worse than what the mothers presented to Tucker Carlson,” Richard Thompson, President and Chief Counsel of the Thomas More Law Center said. “After viewing one of the videos which the seventh graders were directed to watch, I can’t imagine any objective person saying this is not Islamic indoctrination. Clueless school administrators across our nation are allowing this type of indoctrination to take place and it’s up to vigilant parents to stop it. Libby and Nancy should have been praised, not pilloried,” Thompson added. The Muslim teaches the non-Muslim the 5 Pillars of Islam. 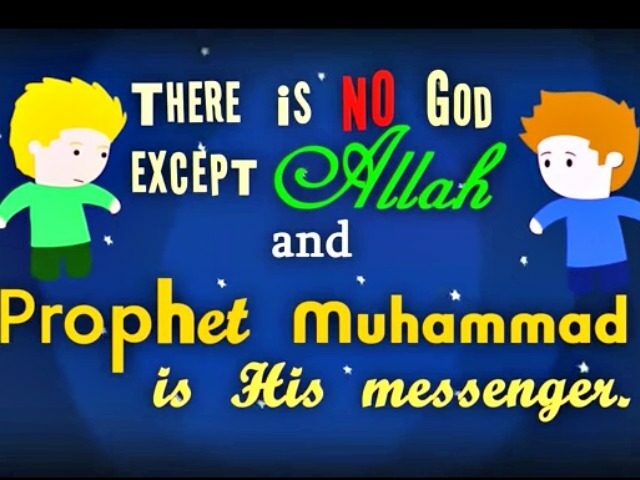 Additionally, a subtitle of bright, multi-colored words of various shapes pronounces a form of the Islamic conversion creed: “There is no god except Allah and Prophet Muhammad is His messenger.” The cartoon ends with a sad non-Muslim boy, who suddenly smiles when the Muslim boy invites him to join him at the mosque for noon-day prayers. . .
“It’s just not fair that within this unit of study the Chatham school district taught one religion to the exclusion of all others, and for the community to be so unkind and unwelcoming towards us, just for having raised legitimate questions as concerned parents,” Gayer said. “One of my fundamental obligations as a parent is to guide the religious and secular education of my children. That’s why I will continue the fight against the Islamic indoctrination now taking place at Chatham, regardless of the personal attacks,” Hilsenrath added. “Libby Hilsenrath and Nancy Gayer asked the board to review the curriculum and requested that either the Islam lessons be removed or that the school spend equal time on the study of Christianity,” the statement concluded.